Gerry Anderson & Irwin Allen Fans! In Stock & Shipping Now ! 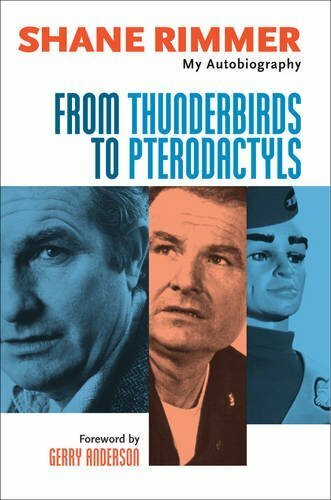 Shane Rimmer's voice is familiar to millions from his role as Scott Tracy, the pilot of Thunderbird 1, but there are many other facets to his remarkable career. In From Thunderbirds to Pterodactyls, Shane recalls the years he spent as an actor, voice artist and writer for Gerry Anderson's classic productions, as well as his appearances in other memorable shows such as Doctor Who, Coronation Street and Lipstick On Your Collar. Equally at home in Star Wars or Out of Africa, Shane's talents as a character actor have been called upon by some of the film industry's leading directors. He worked for Stanley Kubrick in Dr Strangelove and Christopher Nolan in Batman Begins. Between the two he notched up appearances in three James Bond movies and had a close encounter with a low-flying dinosaur in The People that Time Forgot. This wry and refreshingly frank autobiography sheds new light on some of the best-loved films and television series ever made, as well as revealing what life is really like for a jobbing actor in the sometimes less than glamorous world of show business. Limited edition hardback, dust jacket. Thunderbirds - SoundTech TB2 from Japan!